Not Steve Jobs! Stephen Chukumba! What Would Stephen (Chukumba) Do?! So I’ve spent the past two days bitchin’ and complaining engaged in thoughtful dialogue about what advertisers did wrong with their Super Bowl commercials, from a social media perspective. Sure, I was disappointed, but what would I do differently, if any of those brands had hired me or my firm to manage their social media efforts? 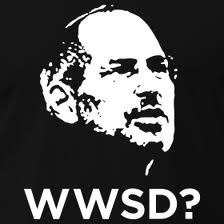 So without further ado, What Would Stephen Do (WWSD) to make Super Bowl XLVII commercials more socially engaging? 1. Seed. If you’re a marketer, you knew that the ads that ran during the Super Bowl were available before the big game. Only a select few knew this. Why? Why not make these commercials available to your active social media audience? Everyone who has ‘liked’ your Facebook page, followed you on Twitter or belonged to any of your social media networks should have received a private message letting them know that the commercial was going to be available before the game. They should have been encouraged to give their feedback and share, share, share! In this way, advertisers would have given their loyal followers exclusive, first-look access, and built valuable in-roads with folks who were already interested and advocates of their brands. For Super Bowl XLVII, I’d make sure that I seeded my audience with snippets, trailers, teasers, sizzle reels, behind-the-scenes, and other exclusive content to prime them for the big show. 2. Give Explicit Calls To Action. One of the greatest issues I had with the commercials which aired Sunday, was the absolute lack of clear calls to action. What <brand name here> did you want me, the viewer, to do? Hey Chevy! You and your apocalypse ad. Was I supposed to stock up on Twinkies? I know you want me to buy your cars, but you could tell me to visit your Facebook page, website or something! 3. Rewards & Giveaways. You’ve got to give something to get something. In social media, the law of reciprocity is understood. So if I were advising any of these brands, I would make rewards and giveaways an explicit part of my strategy. Several brands integrated Shazam into their commercials. If you used Shazam to find out the title and artist of the song in the commercial, I <brand name here> would send you the song as a free download. Everyone who “liked” my car company on Facebook would be offered a free test drive. “Like” my beverage or snack company and get a coupon for a free sample. Tweet my hashtag, and get a discount when you file your next tax return with my company or register for insurance. There is no greater way to build brand loyalty, than to give things away. And give sh*t away, we would! 4. Contests. The NFL was the only brand that understood the inherent value of running a contest. The commercial for the NFL Perfect Fantasy promotion, ran throughout the Super Bowl, was the only contest from any of the brands. If I were advising a car manufacturer, the contest would have given a way a new vehicle (or a lease for a year). A food, beverage or snack brand, free beverages/snacks for life. Tax brand, free tax preparation. Clothing retailer, free wardrobe. Insurance company, no premium policy. Regardless of the brand, I would incentivize social media participation and sharing with a contest. 5. Polling. One clear opportunity that was lost to everyone who aired a commercial during the Super Bowl, was the chance to find out what their audiences thought. Did you like the first quarter? First half? Half-time show? Our commercial? Our product? The Super Bowl? Who do you think is going to win? What do you think the score will be? Who do you think will be the game’s MVP? Anyone/everyone could have asked probing, insightful, or humorous questions easily. Aside (one again) from the NFL, which asked people to vote for the MVP of the game, there were absolutely NO POLLS. WTF! I would ask questions until I was blue (no pun intended, but completely apropos) in the face! If you had hired me <name of brand that didn’t hire me here>, I would have given you far more run for your money, AND you would have incalculably valuable data THAT YOU COULD IMMEDIATELY ACT UPON to boot. So next year, make sure I’m on your short list.